Features a musical meditation from earth, fire, water, spirit, and night sky mixing pulsating drums, ambient sounds, and brainwave pattern entertainment. The current project called Shaman's Elemental Journey traces the exploration of five worlds represented by Earth, Fire, Water, Spirit and Night Sky. It contains an eclectic collection of rich organic drum and shaker sounds combined with the sounds of nature. The frequencies and tempos used align with each Element or World. Each Elemental step increases awareness and energy. Earth Shaman Meditation starts the journey. Open to new possibilities and adventures with each step and each beat of the drum. Your heart and Earth beat as one intentional spirit. The Water Shaman is a journey of awakening into the flow of Living Waters. Began the Quest at the source of a stream. Gentle rain falls while birds welcome you. Slowly drift deeper down as you enter the Temple of Flowing Waters. Hear the mighty drum resonate over the dark pools of energy as the shakers keep your intention on track. A Loon calls in the distance. Open and flow as the harmonics rise and converge into a Oneness of Knowing...an inner-vision quest using ambient sounds, and entrainment frequencies. The Fire Shaman Meditation is a Raven Medicine Meditation. Heal the mind and spirit from doubt and worry. Distill the soul. Release the fire within to energize your being. 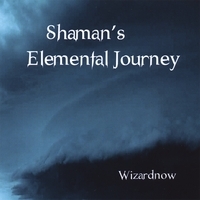 Align the Shaman's Elemental Journey. Become a new Energy Shaman. Spirit Shaman Meditation. Soar above the Earth. Ride the Wind. Allow Wisdom, Truth and Clarity to unfold in this the Air-Spirit Meditation. The Night Sky Shaman Meditation is the space which holds the other four elements. Walking out under the stars, you feel the connection with the Universe. Begin again the Shaman's Elemental Journey. Take each step with purpose and intent. Become a new Energy Shaman. Give your full attention and intention to the realization and perception of the Shaman's Elemental Journey. Stereo Headphones are recommended. This artist is unlike any other. I use all his music at various times while doing my healing energy work on clients. It keeps me focused and assists me in keeping my energy level high.